In With Winter Comes Despair, we hear a maturing Sapremia  characterized by its ingenious arrangement of phrasal riffs that use common or even simple building blocks to craft meaningfully elaborate statements. In order to produce such phrases, Sapremia resorts to structural techniques reminiscent of hard classical approaches which nest period forms  and rondo-like miniature repetitions of structures within each other . Now, the aforementioned nesting takes place when a period form is repeated two times, with the second repetition have a different consequent. The rondo-like miniatures happen in less numerous instances, when instead of two terminations to a riff, we have three, and the variations take turns alternating with the original riff, often spelling out a self-sufficient and expressive section of music. The ways in which these all can be combined give way to a myriad forms and possibilities. Moderate use of odd-numbered repetitions provides for interesting and unpredictable gang  sections that could enrich the music further if we were to find them more often, interspersed with the more assertive quadruple repetition scheme. However, even when remaining under the even-numbered repetitions, the combination of appropriate destibilizing and stabilizing riff-types, strengthened by motific linkage, expresses itself in creative arrangements which nonetheless create interest and force from well-known, common approaches and motifs. By way of example, ‘Forgotten Paradise’ features a main section (which in this style often comes back as a ‘theme’ that serves as the ‘soul’ of the piece ) made by the alternation of a frenetic, unstable riff (‘A’) underscored by blast beats, and a stable period-form riff (‘B’) underlined by a manner of d-beats. The section in question looks like this: Ax4 Bx2 Ax2 Bx2 B’x2, where B’ features a sinking feeling provided by the change in percusion from d-beats to slow snare hits with a fast double-bass. So instead of having two riffs repeating 6 times, these are arranged from common motific bases for linkage, while provided textural (which I argue is provided by the percussion density) and melodic contrast and resolution (in the direction of the guitar line in relation to a central tone). Additionally, the previous riff analysis brings to light other important devices of death metal composition. The heavy, and sometimes dynamically monotonous phrases of the guitar will receive balance from variating the approach of percussion, which as a vital part of the music can radically define the character of the section. This serves to stave off pure repetition of material, while allowing ideas to be cemented in the listeners mind. And like the best underground metal, Sapremia uses harmonization minimally and as a punctuation mark . An intense and sinister coloring is brought out of this music by utilizing harmonization upwards in 4ths instead of 5ths, and is a staple of the more satanic-souled death metal bands bent on a destructive sound. Groove sections are used for release throughout the record, effecively achieving a functional role as dispersers of tension and moving the music forward smoothly. 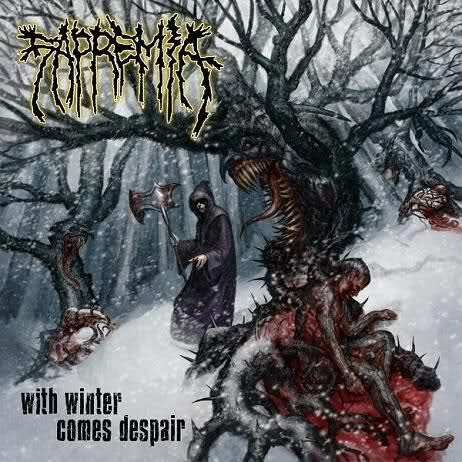 But the best and most integrated results are achieved when Sapremia instead uses to this end arrangements that sound inspired in Scandinavian death metal sensibilities (we can hear this towards the middle of ‘The Despair of Winter’. In the latter this nordic metal influence manifests itself in more detailed, if simple, arrangements consisting on a melody over the repetition of a short motif, and in other cases may even hint at the use of a countermelody. In short, the latter kind of passages, including those in which a strong melodic phrase comes to the fore over a power chord ‘enunciation’, are preferable —because more substantial— to the hard grooves which at times infect the music. Piecewise structures used by Sapremia in With Winter Comes Despair derive cohesion from motif manipulation and reinsertion of key passages, which sometimes even give the impression re-transitions towards the end of songs after middle development sections. What is most laudable in Sapremia’s music is moderation in the use of techniques, especially the ones that contrast and call attention to much, and the fact that each device is used towards functionally coherent and balanced expression. Here is a distinguished example of empirical discovery of music in death metal building narratives crafted without formula, letting each piece speak for itself, as the musician chisels the creature already extant within the bare stone. Antecedent-Consequent structures, where the consequent establishes the same opening ‘statements’ as the antecedent, but introduces a novel way of ending. More often than not, the consequent leads to a resolution that the ending of the antecedent leaves open ended. One can hear this in Pietro Locatelli’s The Art of Violin. The nested period form in particular is easily re-discoverable by the assiduous metal musician, and its use figures prominently here. Refer to the satz and gang concepts of Arnold Bernhard Marx. This new manifestation of DMU is much more interesting than its recent predecesors. I miss the rap battles in the comments section though. This album really has a Scandinavian tinge too it (in a good way, I think). As the article points out, it’s in the tone and melodic directions of the riffs.